CPM series pumps are single stage, end suction volute type pumps. Open impellers are used in accordance with DIN 24 256 and TSE-EN 22 858 standarts. Suction and discharge flanges are according to DIN 2533 standard. The impellers are balanced dynamically in an electronic balance machne. The thrust (axial force) is balanced with the back vanes. Since the shaft diameter is highl resistans to bending and the distance between the bearing and the sealing is short, pump can operate at optimal conditions for the sealing. 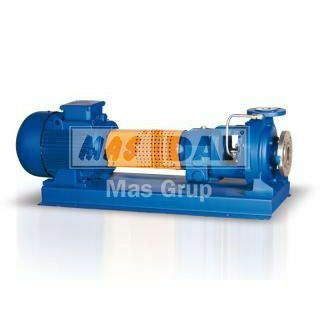 The pump is provided with the rigid shaft capable of supporting different loading conditions. Rolling bearinga are used in centrifugal pumps. Bearings are lubricated by liquid lubricant or grease. At CPM series chemical process pumps, motor and coupling applications are done according to atex standarts, where necessary. Mechanical seals and other equipments, that are being used in ATEX approvede CPM series, are determined by the explosive conditions. For handling aggresive organic and inorganic fluids in the chemical and petrochemical industries.